Distance: 3000 light years ?? Supernova Remnant (SNR) RCW 86 (G 315.2-2.3) is a large 40′ shell in the southern constellation of Centaurus near the bright star Alpha Centauri. �It is thought to originate from a supernova observed in A.D. 185, which is the first historical report of a Galactic supernova. It is one of the brightest SNRs observed in X-Rays in our Galaxy. �Its full size based upon the radio data is larger than our field-of-view, so the bright southwest (SW) section was imaged with 18.5 hours of H-a and OIII data. �Its distance has been a subject of great debate, ranging from about 3,000 – 10,000 light years. It’s age is estimated to be 1,800 years. The image above is about 27 x 27′. �North is up and East is left. 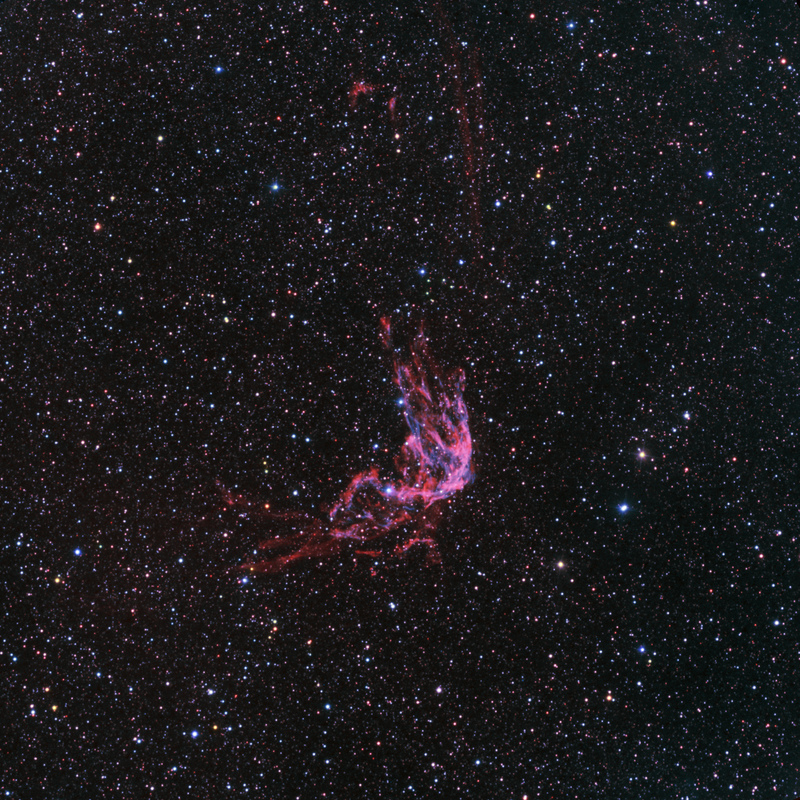 �H-a� was color-mapped to red/magenta and OIII to blue-green with short RGB data for star colors. The image below is an H-a map from R.C. Smith (Astron. 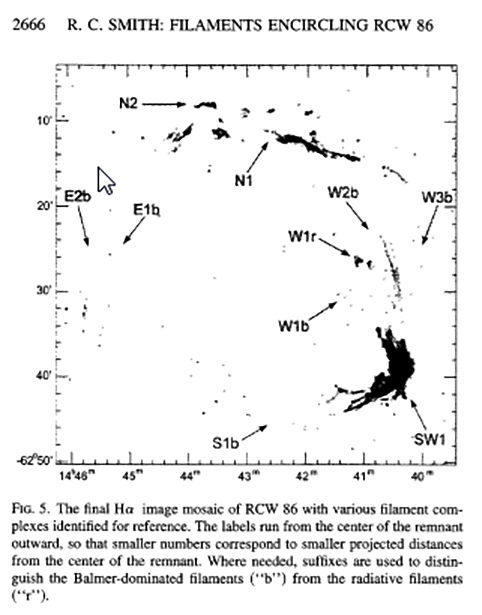 J., “The Discovery of Balmer-Filaments Encircling SNR RWC 86”, v114, No. 6, 1997, p 2666) that shows the full SNR. �My image captured SW1, W2b and W1r, which are annotated on my image below Smith’s image. � A most unusual imaging target.